When I connect my Arduino Mega 2560 to a wall power supply and touch the reset pin the Arduino resets. If I connect the Arduino to a USB cable to the laptop and touch the reset pin it doesn't reset. You touching the reset pin, don't do it, no more problem! 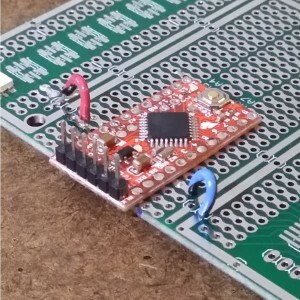 Connect a 100nf capacitor between the GND pin of the Arduino and earth ground and your mysterious reset will not happen. The problem is that I have had a relay connected to the Arduino and when the relay opens and closes the Arduino also resets. I've disconnected it and narrowed the issue down to the reset pin receiving some kind of interference. In other words Arduino resets still without the relay connected too. Oh, so this is another one of those posts where it's going to be twenty questions until we know what you're actually doing? Okay, I'll play. What's the relay controlling and at what voltage? Post the schematic or diagram of all connections. How are the connections made? Are you using decent connections, or thin wires in low quality breadboard? What kind of power supply is it? Could the power supply be crap? Also, is it a bare relay or a module? If it's a bare relay, have you installed a flyback diode? Without that, it will put a load of noise onto the power rails. Even with it, relays can do that - it's an inductive load. You need to supply details on the relay (link to product page is fine) and power supply. It is not unusual for relays to cause reset problems, though; often people wind up powering them via a separate supply. Don't make us play 20 questions, give us enough information to solve your problem. Don't just answer one of our questions, answer them all, plus any other info that might be useful. The power supply is a regulated PC like power supply with variable voltage control. Relay is powered via the GND and VCC pin of the Arduino itself. As mentioned, regardless of whether relay module is connected to the Arduino board or not if I touch the RST/RESET pin with a little screwdriver for instance the board resets itself. I have made up exact same circuit with one of these boards (below) and reset issue never happens. Could it be that this larger board has some extra components? That's as clear as mud. Post a link or a picture please. That could be the source of your problem, please post a schematic (hand drawn is fine) or clear photos of the components and wiring so that we can see how things are connected. We still need to know what you're controlling with the relay. AC? DC? Please show this in the schematic or explain. The power supply was purchased a few years ago, I don't have an image or link for it. Also I'm away so can't do any schematics. I control a DC device with the relay but this happens when if no device is connected to the relay. In the meantime regardless of the relay why does the board reset itself when RESET button is touched with a screwdriver?